“Their bio states they’re from Canada, but they sound like they’re from another planet.” This is more or less the thought that came into my head when I blind-purchased Dimension Hatröss in 1988. I was expecting a thrash metal album, what I got was something that was largely beyond my comprehension at the time. The album was intense, chaotic, dissonant, energetic, abrasive and utterly fascinating. It would be several more years before I would be exposed to the music of King Crimson and other more underground progressive rock acts that influenced Voivod, but even once I knew the context their individuality was undiminished. Album opener Obsolete Beings kicks off the proceedings in driving, uptempo fashion. It sets the stage for the apocalyptic tale to follow, describing a lost, social-media obsessed society that’s ripe for conquest. It’s an infectious rocker played at a fast gallop with an excellent vocal performance from Denis “Snake” Bélanger and a tasteful melodic guitar solo from Daniel “Chewy” Mongrain. This is Voivod at their most accessible, while still retaining the requisite twists and turns expected. After that preface we’re thrust directly into the main plot via The End of Dormancy, a thrilling multi-layered progressive epic told from varying vantage points. It’s the tale of a battle at sea, of an ancient extra-terrestrial unknown rising from the ocean depths and the carnage wrought upon a technically inferior species powerless to defend themselves. The musical arrangement mirrors the twists of the tale, veering from a doomy, head-bobbing ship-at-sea rhythm, to the militaristic prog/thrash battle sequence and the dirge-like conclusion which captures the fractured mind of the sole survivor. Orb Confusion takes a delicious u-turn into punky, new-wave territory peppered with colourful Fripp-esque guitar chords. Its got a playful, almost danceable groove that has me wanting to bounce around the apartment while playing it at neighbour-torturing volume. It is reminiscent of some of their other more pop-centric tunes from the past including Moonbeam Rider (from The Outer Limits) and The Prow (from Angel Rat) and would make a good single if we lived in an alternate universe where good music was actually still played on the radio. The Wake also doesn’t shy away from the more aggressive aspects of their sound as evidenced by the blistering thrash excursions of Inconspiracy and Event Horizon. These two tracks harness the power of their musical arrangements to hammer home the themes of mind control and environmental apocalypse while still containing plenty of left-field musical moments (including strings on the former). 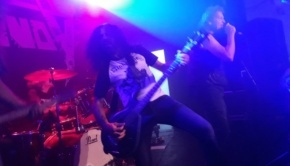 Throughout The Wake you can hear elements of all the various stylistic paths that Voivod has trod over the years, but tempered with the maturity and focus they’ve gained from three decades of activity. 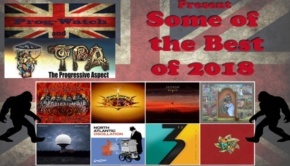 In their classic late ’80s/early ’90s run of albums they slowly tempered their attack somewhat, smoothing out some of the more jagged aspects of their arrangements and reducing the thrash quotient for a more polished approach. The track Spherical Perspective gleefully jumps right back into the maelstrom of Killing Technology and Dimension Hatröss and is one of the most aggressively progressive tracks they’ve recorded in years. The teeth-gnashing intensity of the mid-section is a cathartic blast and then the song makes an effortless turn into melody with the sweeping coda. The most impressive stretch of The Wake is contained within the final two stellar chapters; Always Moving and Sonic Mycelium. The former is a perfectly-executed melding of thrash intensity with Syd Barrett psychedelia (in 15/4 time no less) and a lovely melodic through-line. The latter is a 12-minute suite that revisits and recasts themes explored earlier in the album (and also reprises a section from Jack Luminous off The Outer Limits), eventually morphing into a classical string arrangement for the coda. It’s a perfect summation of everything that came before and a fittingly epic conclusion to our tale. 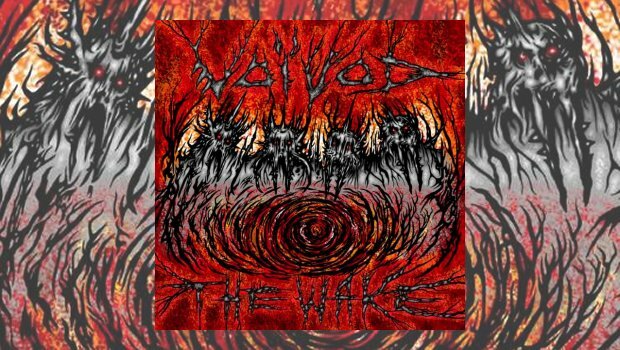 Voivod spent two years perfecting The Wake and that long gestation period has allowed them to create an instant classic of an album that truly equals the heights of their classic period and also points toward thrilling additional chapters in the future. The most fully realised progressive work I’ve heard in 2018 and very likely my album of the year.